Abu Bakar Bashir, center, the alleged mastermind of the 2002 Bali bombings, walks as he is visited by Yusril Ihza Mahendra, right, who is the lawyer of Indonesia's presidential candidate Joko Widodo, at Gunung Sindur prison in Bogor, Indonesia, Jan. 18, 2019. A radical cleric thought to be the spiritual leader of the Bali bombers will be released from prison on medical grounds, Indonesia's president said Friday. It was Indonesia's deadliest militant attack and prompted Jakarta to beef up anti-terror cooperation with the U.S. and Australia, which has previously opposed clemency for Bashir. Indonesian President Joko Widodo said on Friday that he had agreed to order the ailing preacher's release from a prison on the outskirts of the capital. "The first reason is humanitarian," Widodo told reporters. "He is old ... and his health condition was also part of the consideration." 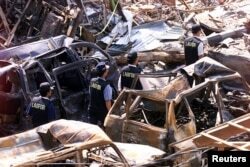 FILE - Indonesian forensic policemen walk past destroyed cars near the site of the Oct. 12, 2002, bomb blasts at Kuta on Indonesia's resort island of Bali, Oct. 18, 2002. Widodo did not say when Bashir would be released, but one of the cleric's lawyers said it could be as early as next week. "If I am released, I'll praise Allah," he told reporters, adding he was not hostile to the state. Bashir, the co-founder of an infamous Islamic boarding school known for producing militants, was jailed after authorities in the world's biggest Muslim majority country broke up the camp. Al-Qaida-linked JI was founded by a handful of exiled Indonesian militants in Malaysia in the 1980s, and grew to include cells across Southeast Asia. An anti-terror crackdown weakened some of Indonesia's most dangerous networks, including Jemaah Islamiyah. The Islamic State group proved to be a potent rallying cry for Indonesia's radicals, with hundreds traveling to the Middle East to join the jihadists. Last year, a wave of deadly suicide bombings at churches and a police post rocked Indonesia's second biggest city Surabaya. Those attacks were carried out by families — including children — linked to local extremist network Jamaah Ansharut Daulah, which has pledged allegiance to IS.